What do Westinghouse Electric, General Motors (NYSE: GM), Chrysler, Pacific Gas & Electric (NYSE: PCG), and Kodak (NYSE: KODK) have in common? They impacted many financial counterparties when they declared bankruptcy, particularly business-to-business customers and suppliers. 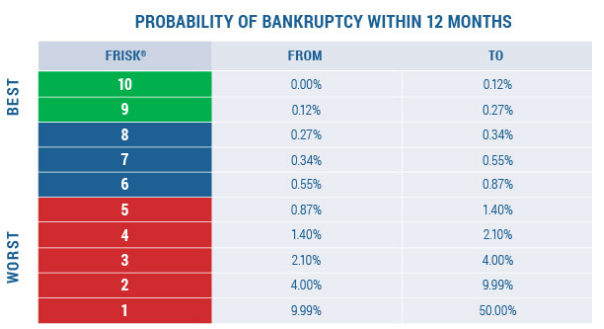 While it seems that large public company bankruptcies do not occur very often, corporations are impacted by these events all the time. In the case of Westinghouse, utility customers and many others are now dealing with major project delays in addition to huge financial overhangs. Unfortunately it only takes one large corporation to bring about a lot of financial pain and a long bankruptcy process. CreditRiskMonitor sees Toshiba's (TYO: 6502) decision to let Westinghouse fall into restructuring as just another reminder of how important it is to monitor all of your business partners’ credit risk on an ongoing basis. One of CreditRiskMonitor's most important risk management tools is the FRISK® score. This metric is 96% accurate in predicting financial distress looking out 12 months. In this case, Toshiba's FRISK® score trended between a FRISK® range of "1" and "4" throughout 2016. This low range is part of the FRISK® "red zone," the bottom half of the FRISK® 1 (worst) to 10 (best) scale. So, subscribers were already alerted to the financial risks, including risks at the company’s subsidiaries. In late 2016, Toshiba’s score then sharply fell to a "2," which signaled a substantial deterioration in financial health. It then came as no surprise that Toshiba had to let Westinghouse, and other subsidiaries, file for bankruptcy just a few months later on March 29, 2017. The FRISK® score, in one easy-to-use number, dynamically summarizes the information of stock market sentiment, company financials, credit agency ratings, and the crowdsourced behavior of CreditRiskMonitor's subscribers. Our subscriber base includes over 35% of the Fortune 1000 in addition to many large corporations around the world. The importance of the FRISK® score is that it helps subscribers focus on companies that require the most attention, presenting the biggest dollars at the greatest risk. The FRISK® score provides risk professionals a quick and effective way to watch over the most important companies they do business with every day. Toshiba, and thus a group of its subsidiaries, had been flashing warning signs that risk managers needed to address. Westinghouse’s bankruptcy is just one more piece of evidence that you cannot give big public companies a pass simply because they are, well, big public companies. In fact, being a public company often just means that the risks on a dollar basis are larger. Westinghouse was in the middle of building two nuclear power facilities for Southern Co (NYSE: SO) and SCANA Corporation (NYSE: SCG), among others, but these plans have now been disrupted. It's likely that Westinghouse will continue to operate through the restructuring process, but the impact on day-to-day operations is unpredictable for what are sizable and important projects for this pair of utilities. For these utilities, cost overruns on the nuclear projects are a billion-dollar headache. Cost overruns were supposed to be borne by Westinghouse, but in bankruptcy we often see contract terms repudiated. By some estimates the final bill for the Vogtle and VC Summer projects are expected to total more than $40 billion. In procurement contracts, it’s great to get your vendor to take on major cost risks. Unfortunately, when a financially weak vendor cannot make good on its commitments, a bankruptcy can place those risks right back in the buyer’s lap. Adding to the trouble, this bankruptcy-led decision will likely impact all of Westinghouse's creditors. Those impacted may include other construction names all the way down to various parts and material suppliers. The smaller names could also be gravely impacted by the project delays in addition to the potential financial hit. Disruption affects the whole supply chain and may make recovery slower still. To put a number on its exposure to common creditors, Westinghouse appears to have had more than $300 million in trade debt, shown as the top unsecured claims of its bankruptcy petition. As you can see, the financial hit is widespread and it only takes one large corporate bankruptcy to create a huge domino effect. No large company you deal with should ever get a free pass when it comes to financial risk. In 2016, two major names that held several billion in assets, Hanjin Shipping and Pacific Exploration & Production Corp, cratered into bankruptcy restructurings due to their own industry challenges. Customers and suppliers were forced to scramble. Westinghouse did not come as a huge surprise to many of us, but nevertheless hundreds of companies have still been left to deal with a painful bankruptcy aftermath. Some of those facing these bankruptcy challenges may have seen this coming, and did as much as was feasible to reduce their risks beforehand. Yet it is hard to imagine so many decisively chose to expose themselves so much: no doubt many simply didn’t believe a bankruptcy could happen at a company like Westinghouse. With a tool like the FRISK® score, you will quickly obtain reliable early warning signs of financial distress so you can focus your attention where it is needed most. You might have an early conversation with a supplier that’s headed for trouble, and/or maybe find an alternative supplier who is able to make good on its commitments. Risk management teams should be well aware of bankruptcies before they happen, especially for the largest names they do business with.